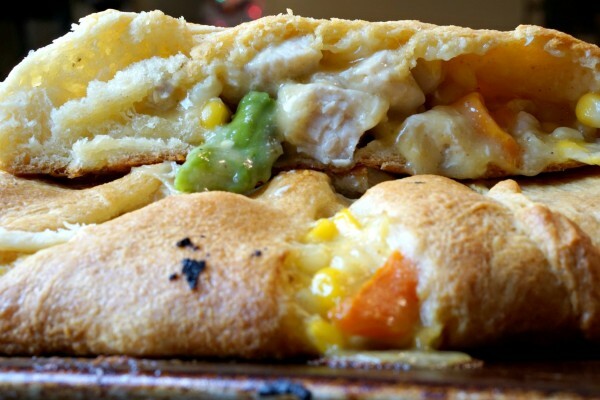 Chicken pot pie crescent ring, it’s what’s for dinner. I am somewhat obsessed with easy dinners lately. They allow so much more time for binge watching Netflix or Amazon Video (I’m all caught up on Downton Abbey, now) and spending quality time with my family. Oh, yeah, more time for work and house cleaning, too. Yay (that’s a note of sarcasm). Chicken Pot Pie is on of my favorite comfort foods and I’ve actually written about it several times… here’s my easy chicken pot pie recipe using frozen pie shells. 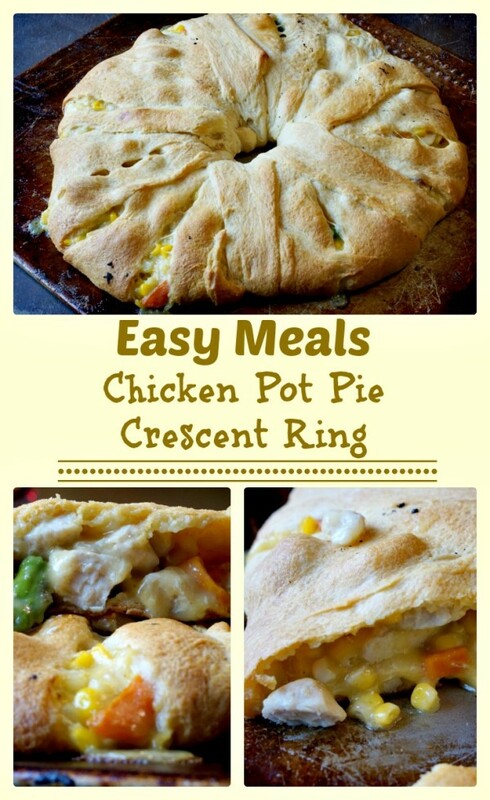 This Chicken Pot Pie Crescent Ring is a comfort food with a twist, will get you hooked on easy dinners, if you aren’t already. While oven is preheating open and pour Veg All in a medium bowl or cook frozen vegetables in the microwave. 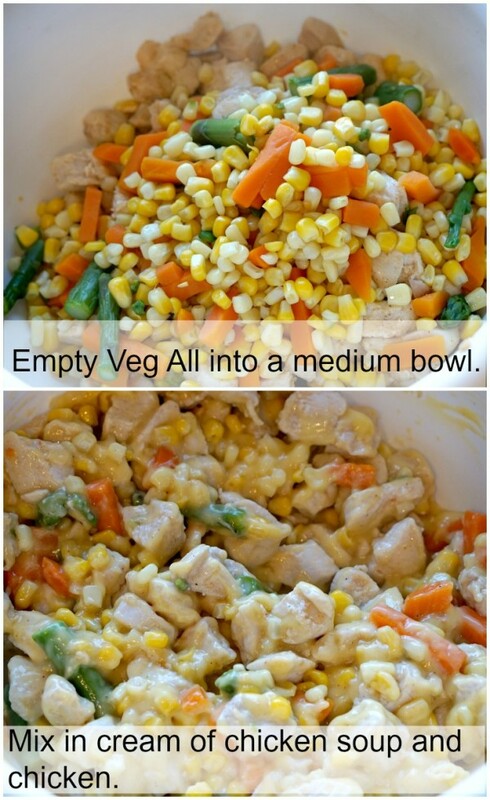 In a medium bowl, combine veggies, chicken, and soup. The mixture will be thick. Add in seasonings at this time if you choose to use them. I found that the canned soup added enough salt flavor, but if you like spice now is the time to add it. 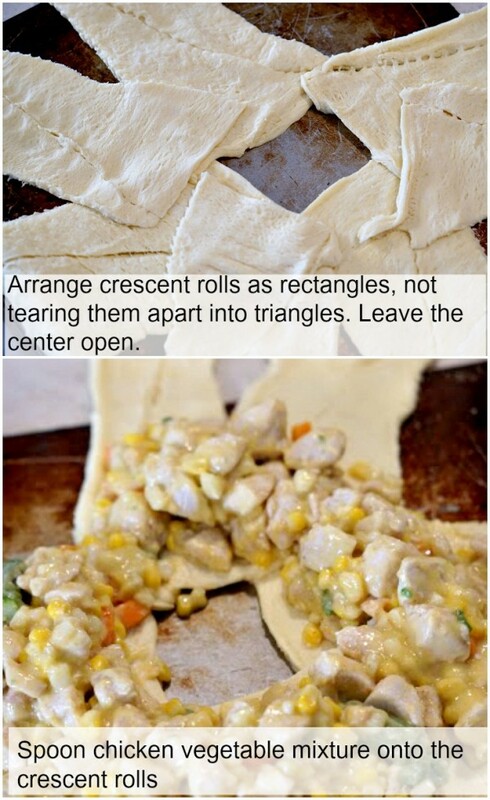 On an ungreased cookie sheet, arrange crescent rolls. See photo for reference. Notice you’ll be using them as rectangles, not tearing them apart into triangles. Leave the center open. 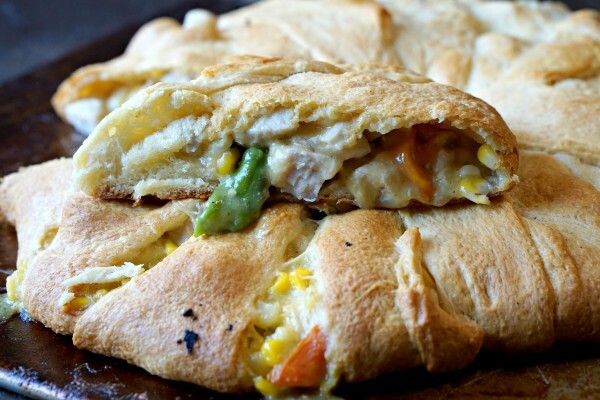 Spoon chicken vegetable mixture onto the crescent rolls (see photo). Leave a little space in the center so you can wrap it all together. If you use a store brand crescent rolls, you might find they’re not as easy to work with. I have made several crescent rings with Pillsbury and they are great, but this one is a bit sloppy in comparison. If you are able to grab the Pillsbury crescent rolls, I highly recommend them. 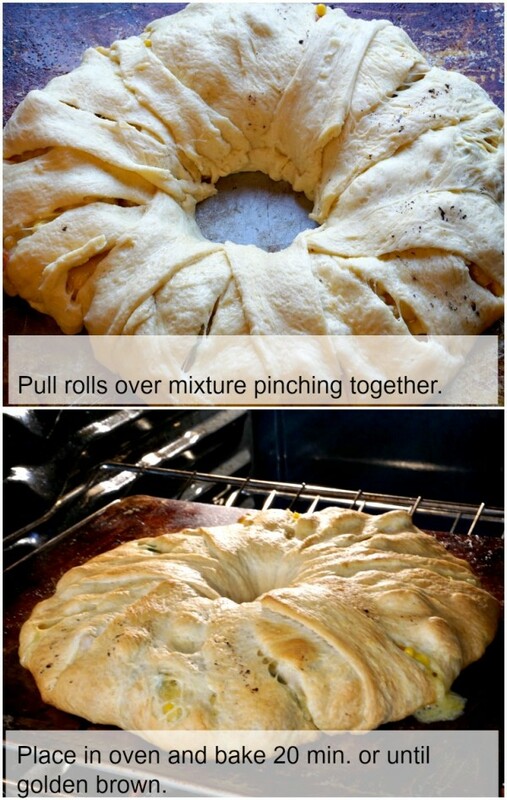 Pull dough over mixture and tuck into the middle, leaving the center open still. You might need to pinch the rolls together a bit but if there are any open spaces, it’s okay. The mixture is thick and shouldn’t leak out. Bake 20+ minutes until crescent ring is golden brown. Ours took 25 minutes, but oven temperatures vary and if you use a different brand of rolls that will make the time different as well. So, just watch it from 20 minutes on, looking through the oven door (without opening it) every few minutes. 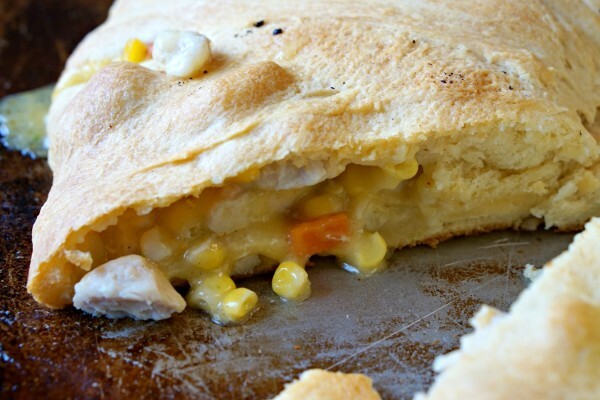 This easy chicken pot pie crescent ring recipe is economical, easy, and puts a new twist on comfort food. It’s a great family dinner meal idea. Enjoy! 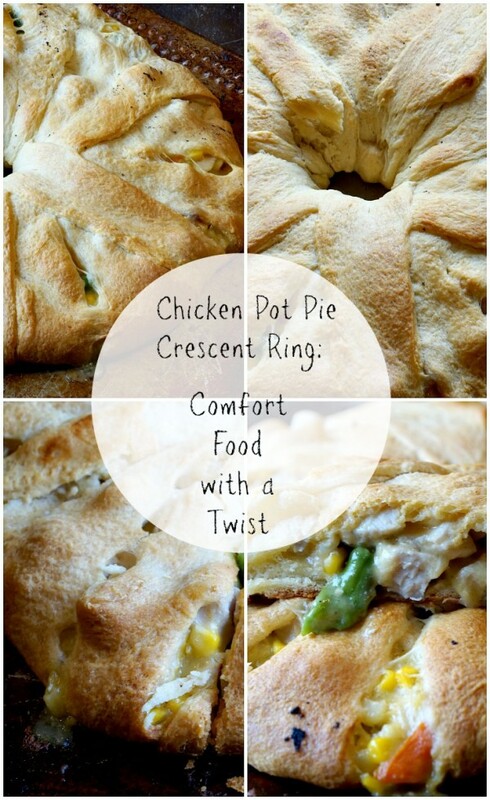 Remember, if you like this post, please take the time to follow all my projects and finds here on Pinterest and pin Chicken Pot Pie Crescent Ring so you don’t forget it! Hope all is well hun! Thanks for sharing this. I love easy recipes like this. I put it on menu…I’m making this for sure! this looks yummy! pot pie is the best! Something that I want to give a try one weeknight. Looks great! i’m more of a “heat stuff on the microwave” kind of guy!! but i will try to get my grandma to try this! !